Fitting Options - Teflon valving, diptubes, special lined 3-piece ball valve. Returnable, reusable containers are designed for high vapor pressure products, are capable of maintaining a nitrogen blanket, and are suitable for pressure filling and dispensing of products. Our UN31A bulk IBCs have similar features and benefits to our smaller UN1A1 containers. This allows the shipper/filler to use our cylindrical IBCs filled with higher vapor pressure rated products than standard IBCs. Black Forest Container Systems, LLC located in Greenville, SC, founded in 2000, is the leading distributor in North America of closed loop custom equipment and multi-trip stainless steel packaging systems. Their product offerings include stainless steel containers, intermediate bulk containers, mini-bulks, totes, ASME pressure vessels, process tanks, storage tanks, flasks, bottles, fermenters, wine equipment and process drums. In addition, Black Forest Resources, LLC the sister company of BFCS, offers a container leasing program. The rental fleet consists of high quality intermediate bulk containers (IBC’s), totes, portable tanks, mini-bulks and small volume chemical and general purpose containers for the agriculture, chemical, cosmetic, food, industrial and pharmaceutical industries. 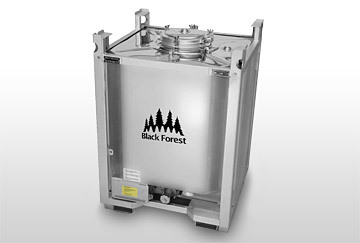 To learn more about Black Forest Container Systems, LLC call 864-386-7414 or visit www.blackforestmktg.com.